NASA’s New Horizons spacecraft took this stunning image of Pluto only a few minutes after closest approach on 14 July 2015. The image was obtained at a high phase angle — that is, with the Sun on the other side of Pluto, as viewed by New Horizons. 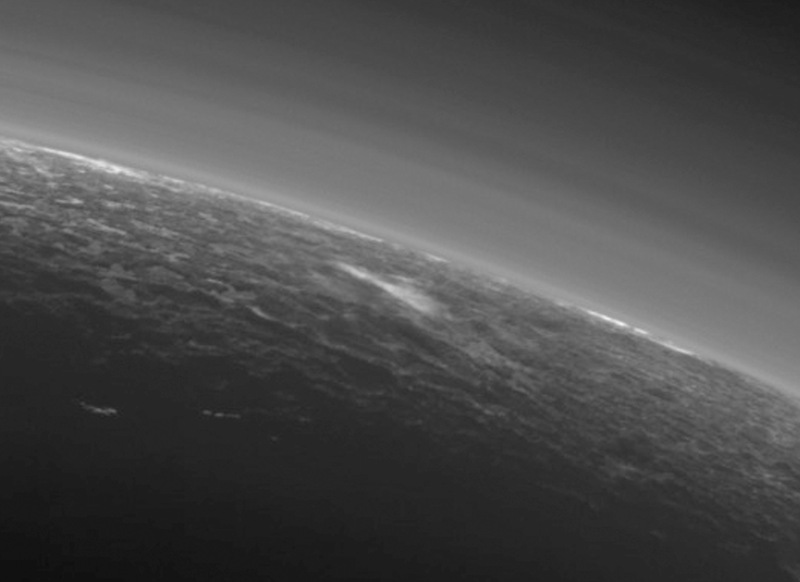 Seen here, sunlight filters through and illuminates Pluto’s complex atmospheric haze layers. The southern portions of the nitrogen ice plains informally named Sputnik Planum, as well as mountains of the informally named Norgay Montes, can also be seen across Pluto’s crescent at the top of the image. Image credit: NASA/JHUAPL/SwRI. 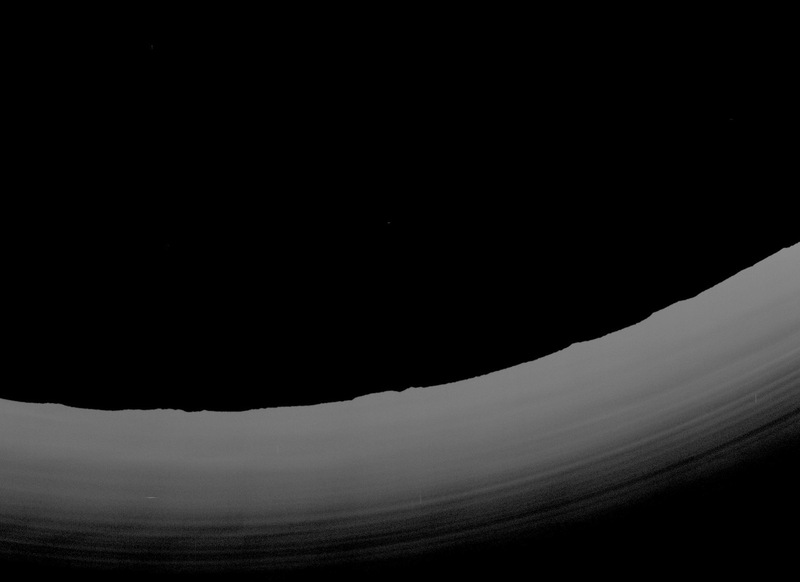 Inset A shows a detail of Pluto’s crescent, including an intriguing bright wisp (near the centre) measuring tens of miles across that may be a discreet, low-lying cloud in Pluto’s atmosphere; if so, it would be the only one yet identified in New Horizons imagery. This cloud — if that’s what it is — is visible for the same reason the haze layers are so bright: illumination from the sunlight grazing Pluto’s surface at a low angle. 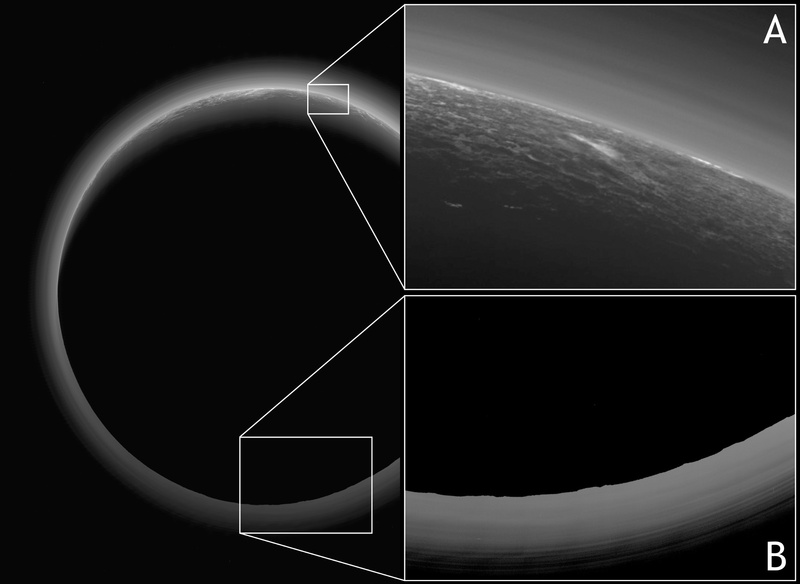 Atmospheric models suggest that methane clouds can occasionally form in Pluto’s atmosphere. The scene in this inset is 140 miles (230 kilometres) across. Image credit: NASA/JHUAPL/SwRI. Inset B shows more detail on the night side of Pluto. This terrain can be seen because it is illuminated from behind by hazes that silhouette the limb. The topography here appears quite rugged, and broad valleys and sharp peaks with relief totalling 3 miles (5 kilometres) are apparent. This image, made from closer range, is much better than the lower-resolution images of this same terrain taken several days before closest approach. These silhouetted terrains therefore act as a useful “anchor point,” giving New Horizons scientists a rare, detailed glimpse at the lay of the land in this mysterious part of Pluto seen at high resolution only in twilight. The scene in this inset is 460 miles (750 kilometres) wide. Image credit: NASA/JHUAPL/SwRI. 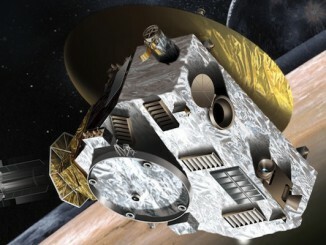 Looking back at Pluto with images like this gives New Horizons scientists information about Pluto’s hazes and surface properties that they can’t get from images taken on approach. The image was obtained by New Horizons’ Ralph/Multispectral Visual Imaging Camera (MVIC) approximately 13,400 miles (21,550 kilometres) from Pluto, about 19 minutes after New Horizons’ closest approach. The image has a resolution of 1,400 feet (430 metres) per pixel. Pluto’s diameter is 1,475 miles (2,374 kilometres). 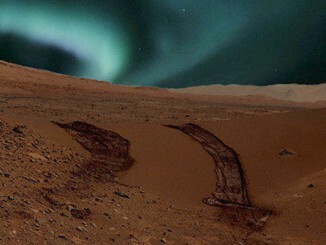 For the first time, an international team of scientists from NASA, the Institute of Planetology and Astrophysics of Grenoble (IPAG), the European Space Agency and Aalto University in Finland, have predicted that colourful, glowing aurorae can be seen by the naked eye on a terrestrial planet other than Earth — Mars. In the latter part of June, Pluto is best seen low in the southern UK sky around 2am local time and reaches opposition on 7 July. 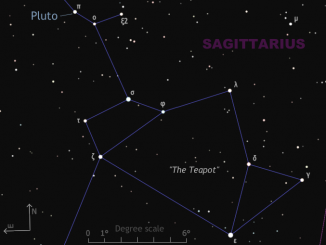 The dwarf planet passes less than 1/20th of a degree south of naked-eye star pi (π) Sagittarii on 26—27 June in the deep twilight of the UK, but Southern Hemisphere observers will have the best views.